It soon became apparent that when going through pictures for a recent feature on the Smithfield Nocturne held in 2007 I could not find one picture of a woman racer. This got me thinking about the creation of the ‘London Women’s Cycle Racing’ league. 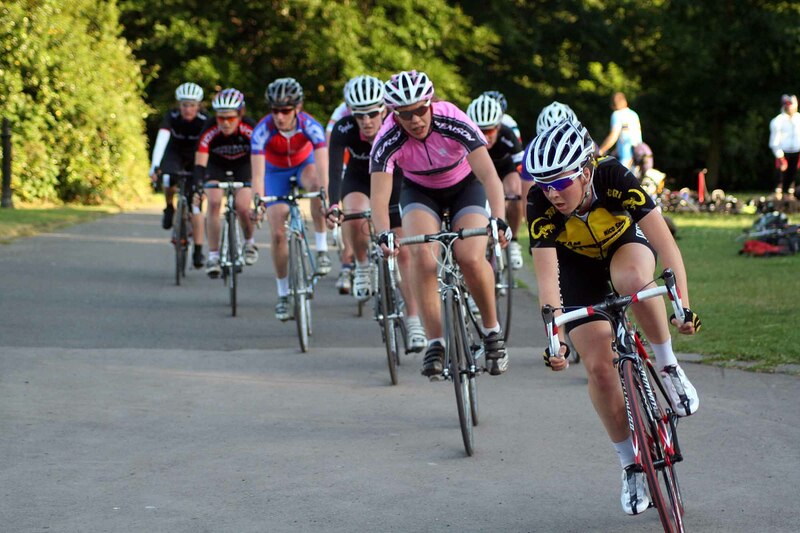 The London Women’s Cycle Racing was formed in 2010 to offer women riders a better chance of racing against each other. Prior to the launch of the LWCR we had noticed that women did race and could be found racing at all sorts of venues, but mostly competed anonymously with the men. At the Crystal Palace Circuits where I helped judge and commissaire, we began to record all women finishers as they flew by in amongst the men. It was no easy task, but we did manage to get a women’s result out each week. This seemed to draw women to the Palace Circuits and subsequently this led to a separate women’s start and finish rather than continuing with the category ¾ men. Again it wasn’t easy juggling these races on a compact circuit and we had to often be tough as we asserted that the women’s race to our minds was just as important (or even more so) as the men’s race. For many men this was quite a mind bending concept. Soon we had good fields of women and it was during one evening in the South London Park whilst we watched a really good and well attended female race that Maria David and I commentated that if only we could flag up races so that women could target them and thus get good fields at selected events. A few words after the race with Maryka Sennema and Rebecca Slack and it soon became clear that we were all in accord. Huge thanks has to be given to the teams and clubs who worked with us during that first season. Also thanks to the riders who made it all worthwhile. I was able to attend a good number of the twelve rounds in 2010 whilst some were covered by Dave Hayward. We raced at Goodwood, the Eagle RC Crits at Hog Hill, at Crystal Palace of course, at the Hillingdon Grand Prix, Essex Giro and the Smithfield Nocturne (the latter three being women only races and which were very rare at that time). We also held two time trial rounds including one in Richmond Park. Maryka and Maria offer below their thoughts on that first year and how they see women’s racing today in 2018.